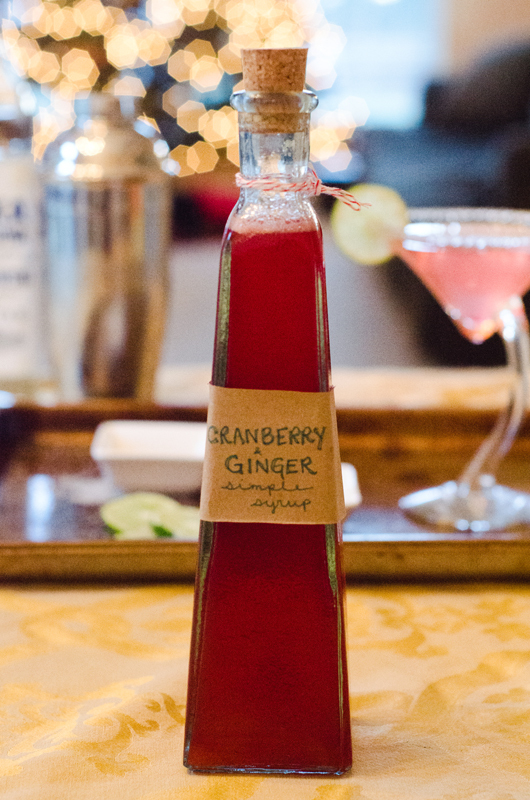 I’ve made you a cranberry and ginger simple syrup and cocktail to match. Actually, I kind of made it for me. I am currently sipping on the one pictured above. I had to test it for you. Make sure it wasn’t awful (It’s not.). You’re safe. Drink away. I had never made my own infused simple syrup before, and it turns out it’s totally easy (perhaps this is why they call it “simple” syrup). Boil some water and sugar, add your desired infusing ingredients, let it all cool and you are in business. It’s not a lot of work, and you will seem super fancy. Nay, you ARE super fancy. No seeming about it. Let’s make some simple syrup! Add your water and sugar into a pot over medium heat. Bring it to a boil. Let it bubble together until the sugar dissolves into the water and it becomes thicker. Stir it occasionally. The whole process will take around ten minutes. 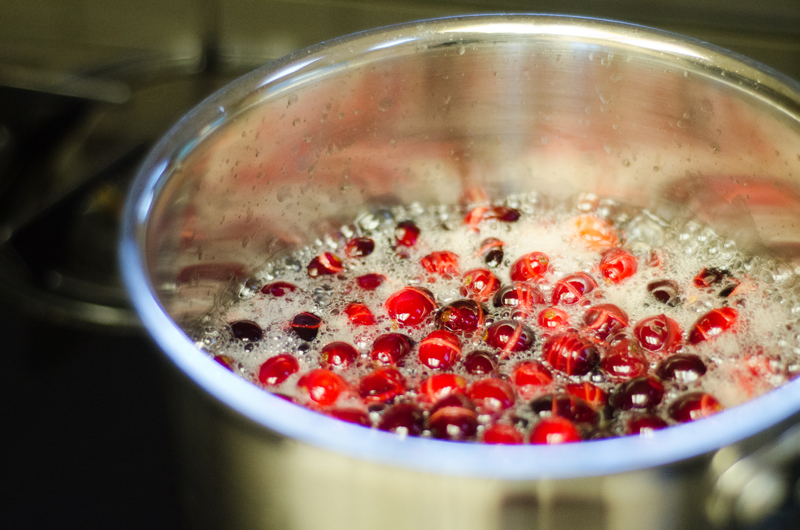 Once it has come to a boil, add in your ginger and your cranberries and reduce the heat. Allow it to simmer for an additional five minutes over low heat. Once five minutes have passed, turn off your flame, remove the pot from the heat and stir. Allow your mixture to cool completely and then bottle it. You can use a fun bottle or keep it simple and use a mason jar. It should last for a few months in the refrigerator. Now… it’s cocktail time! There are tons of possibilities with this simple syrup! I suspect that it would be very tasty with your champagne. I, however, threw it in some vodka, shook it up, and it turned out pretty darn delicious. 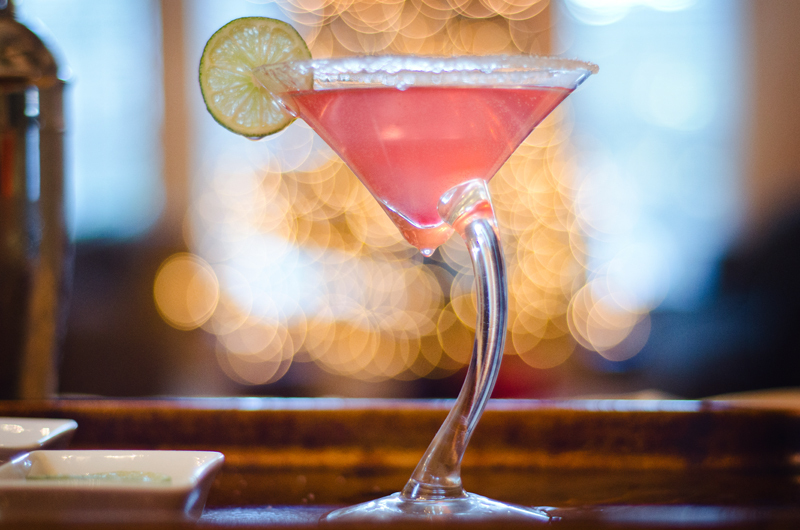 First, take your martini glasses and using a lime wedge, wet the rim of your glass. Place your glass rim down in a shallow dish of sugar. Now you have a fancy sugared rim! How festive! 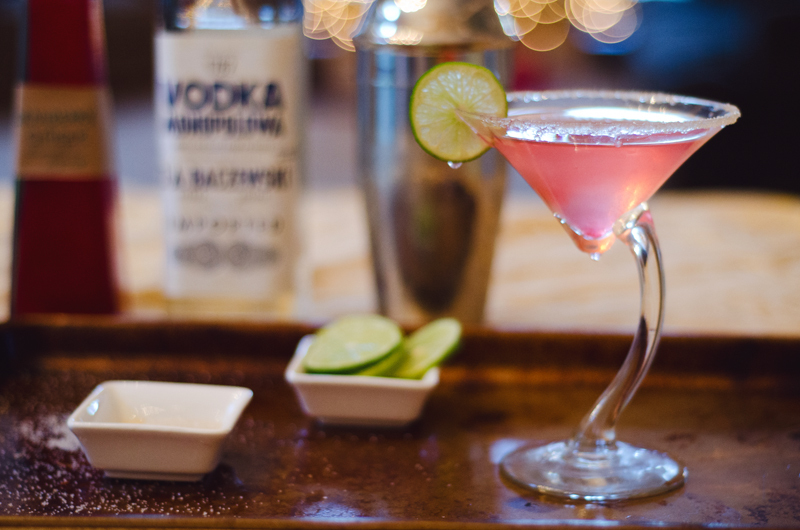 Add your ice, vodka and simple syrup to your martini shaker… and, you guessed it, SHAKE!! Pour your mixture into the martini glass until it is a little more than half way full. Add in some sparkling water. A toast to you, my friends! 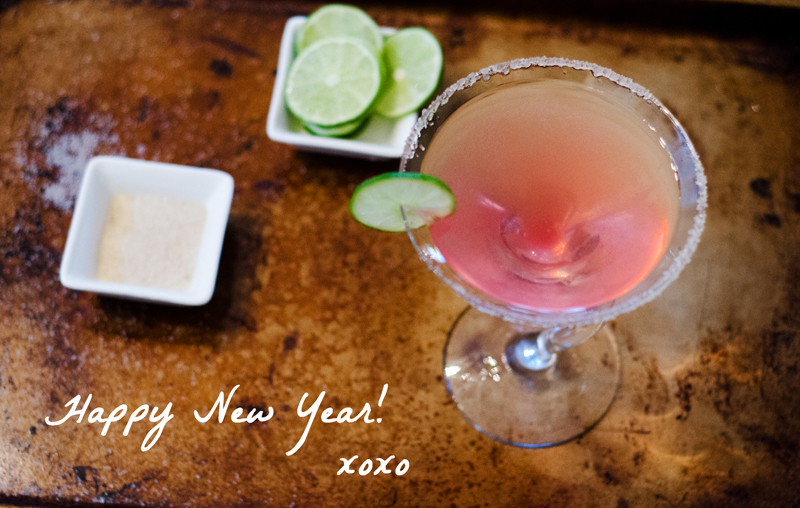 Wishing you love, happiness, and all that is good this new year! Once again, thank you for making 2012 so major. How do you say? Oh yes. You are all the cat’s pajamas. The snake’s hips. The polar bear’s top hat. I might have fabricated that last one… but if you know me, you know I love nothing more than a polar bear dressed up festively. Cheers! THIS IS DELISH!!!! I love it! And your photos are just awesome for this post. I like all the shots (not alcoholic shots, but the actual photographs… well who are we kidding, I like shots too…ha.). Hope you have a wonderful holiday and news years!! Haha! Thanks, Imee! You are too kind. Hope you have a fantastic New Years and a relaxing Vaycay. Eat guacamole on EVERYTHING… also, bug repellent highly recommended. Let me be your cautionary tale. 🙂 See you next year! This looks like my perfect drink. Happy new year! These photos are TO DIE!